A New Map of Asia, From the Latest Authorities. 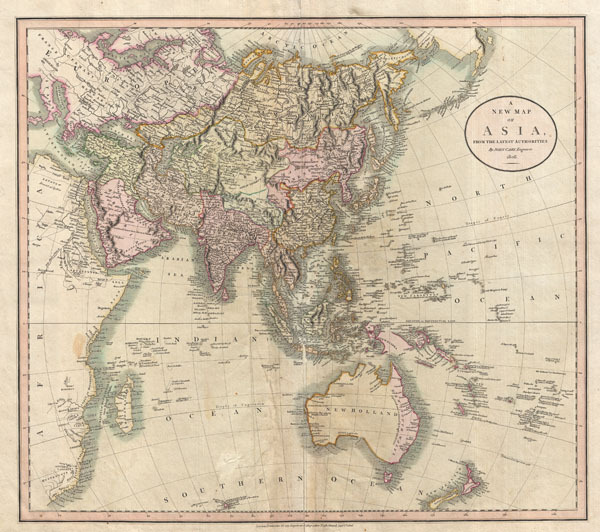 This is John Cary's stunning 1806 map of Asia, Australia, and Polynesia. Covers from the Mediterranean to the Aleutian Islands and from the Arctic to South Africa, Australia, and New Zealand. This beautifully rendered map is truly a masterpiece of engraving, with mountain ranges, lakes, deserts, and rivers excited with such precision that the result appears almost three dimensional. Cary injects astounding detail throughout with countless towns, cities, geographical features, rivers, islands and bodies of water noted. In desert regions fresh water sources are noted. In the seas certain shoals and undersea are included. In China and Manchuria the Great Wall appears. Singapore islands is shown but not specifically named. The Liakhov Islands, in northern Siberia, which some believed to be entirely composed of fossil mammoth ivory, are noted as 'Shore Discovered by Hunters.' Published by John Cary in his 1808 Cary's New Universal Atlas. Good. Some creasing and repairs near original centerfold. Minor soiling here and there. Original plate mark visible. Blank on verso. Rumsey 1657.042. Phillips (Atlases) 714. Fordham, J.C., John Cary, p. 77-82.